Like you, we adore dogs and cats, and have a very particular passion for their nutrition. We know that good nutrition can help make a difference to your pets' health and happiness. At Iams we know how much your cat means to you. The diet of your cat is key to its happiness and well being. The food you feed your cat can make a massive difference to their life affecting their weight, skin, quality of coat, lifespan and even the amount of hairballs produced. Daily nutrition for kittens from 1 to 12 months old as well as pregnant and lactating cats. Your kitten's mother once supplied everything she needed. Now your kitten depends on you. 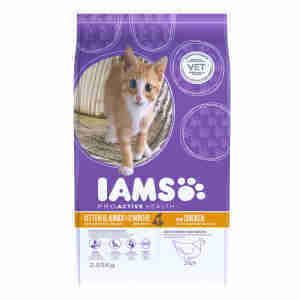 By feeding her Iams, you ensure your kitten gets all the nutrients, essential amino-acids, vitamins and minerals she needs to grow strong and healthy while contributing to the development of her brain and vision. Iams Kitten & Junior is not only good for kittens, it's good for pregnant and lactating cats too, as it gives expectant and new mothers all the energy and nutrition they and their little ones need. She will need the stimulus of play to develop her intelligence and dexterity. You can help to develop her temperament by making sure she socialises with other animals and people. Give her a toy of her own, like a ball or rubber mouse that she can play with. Rich in energy and easily digestible to support healthy growth. An optimal balance of Omega 3 & 6 fatty acids to promote a healthy skin and shiny coat. Natural fibre for healthy digestion and small stools with little odour. *Based on the recommended manufacturer retail price, and recommended feeding guidelines from the manufacturer. Dried Chicken and Turkey (41%), maize, animal fat, wheat, dried whole egg, dried beet pulp (2.7%), chicken digest, calcium carbonate, fructooligosaccharide (0.69%), fish oil (0.68%), potassium chloride, brewer's dried yeast, sodium chloride. Protein 34%, Fat content 22%, DHA 0.1%, moisture 8%, crude ash 6.8%, crude fibres 1.8%, Calcium 1.25%, Phosphorus 0.95%, Magnesium 0.095%, Vitamin A 12,000 IU/kg, Vitamin D3 900 IU/kg, Vitamin E (ά-tocopherol) 140mg/kg. Trace elements: Copper as Cupric Sulphate, pentahydrate:9 mg/kg, Zinc as Zinc Oxide:152 mg/kg, Manganese as Manganous Sulphate, monohydrate:41 mg/kg, Iodine as Potassium Iodide:1 mg/kg, Cobalt as Basic Cobaltous Carbonate, monohydrate:0.4 mg/kg. I have been looking after for 3 weeks my daughter's kitten and decided to give him the Iams kit ten food which he absolutely loved. Didn't need the full recommended serving but he certainly enjoyed it. I have changed from Royal Canin growth, which my kitten loved to Iams kitten as I tried the Royal Canin young neutered male but he wouldn't eat it. He stools are solid with little smell which quite surprised me as he has a delicate digestive system, I agree it might not be quite a nutritional as others, but its probable adequate. I am going to try and combine with the Royal Canin. My two cats aaged 9 and 10 are both fed on this food, it is great nutrition, and good value for money.Both have beautiful glossy coats and are full of energy, you would think thay are both still kittens. I have four kittens and they are looking wonderful by being fed Iams. The goodness is amazing in this product my kittens are active and healthy kittens and their coats are in excellent condition. I recommend Iams Kitten without question.